Black-and-white photographs of Soviet soldiers, civilians and workers who faced and defeated Nazism in WWII opened Monday at the UN General Assembly. 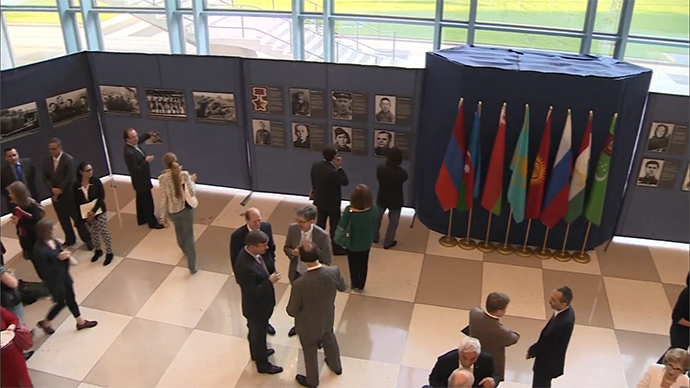 Titled “The Last World War: Remembering for Peace,” the exhibit was organized by the permanent UN missions of Armenia, Azerbaijan, Belarus, Kazakhstan, Kyrgyzstan, the Russian Federation, Tajikistan and Turkmenistan. It features portraits of soldiers, workers and civilians from all over the Soviet Union caught up in the struggle, as well as iconic moments from the war. “If you look at the pictures, they reflect the challenges which the generation of the victors were facing, and which they were able to meet with such distinction and heroism,” said Vitaly Churkin, Russia’s envoy to the UN. Among the exhibits are fifteen photos of Heroes of the Soviet Union, representing the courage, dedication and sacrifice of peoples from all fifteen Soviet republics, in what came to be known as the “Great Patriotic War.” As many as 27 million Soviet citizens perished during the conflict. The exhibit runs from May 4 to May 14 at the UN General Assembly building.